As a weaver and fiber artist, I am fascinated by SLOWCOLOR. The video above not only explains the company’s “trend toward more conscious gifting”, but the natural, handmade processes of the weavers, spinners, and dyers inspire me. I would love to go and visit SLOWCOLOR’s artisans! That would be my dream vacation! We were sent a beautiful Boulder Scarf to review. The scarf that goes anywhere. A treasured companion on your life’s adventures: casual, elegant, for work, and for play. Men like this scarf as much as women. I love my Boulder Scarf. 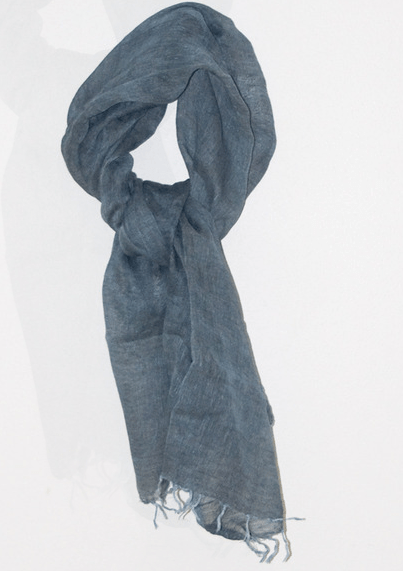 It is the perfect size for how I like to wear my scarves, and the hand dyed linen is rich and beautiful. I can’t help but think of the hands involved in making this product. Handloomed, natural plant based hand dyed, fair trade…a perfect gift for the eco-conscious! Good News! We have one SLOWCOLOR Boulder Scarf to giveaway to a lucky reader! This contest is open to US residence only. No P.O.Boxes. You have until 8:00 A.M. EST December 21st, 2011 to enter. In your comment on SLOWCOLOR’s Facebook page mention what product you would choose and why, and which blog you read about this giveaway with a @tag back to this Eco Child’s Play’s Facebook page. + Comment on another SLOWCOLOR wall post. This giveaway is running in conjunction with Really Natural. Only one winner will be selected from both blogs. « Black Friday Advice: Take Control of Your Money! I like the Dakota Ridge Linen Wrap Shawl! Thanks so much for the fantastic giveaway! I would choose Mango Peel. Besides having a fun name, it is my favorite color: Earthy green. And I love green mango salad! I left a comment on Slowcolor’s FB page and noted your blog and your FB page, along with my favorite -Dakota Ridge wrap in quiet lake. I also liked slowcolor on FB. Thanks for the opportunity! I left a FB comment. I love the Dakota Ridge Linen Wrap Shawl! kelley l likes slowcolor on facebook.